The most effective tool to detect precipitation is radar. Radar, which stands for RAdio Detection And Ranging, has been utilized to detect precipitation, and especially thunderstorms, since the 1940's. Radar enhancements have enabled NWS forecasters to examine storms with more precision. The radar used by the National Weather Service is called the WSR-88D, which stands for Weather Surveillance Radar - 1988 Doppler (the prototype radar was built in 1988). As its name suggests, the WSR-88D is a Doppler radar, meaning it can detect motions toward or away from the radar as well as the location of precipitation areas. This ability to detect motion has greatly improved the meteorologist's ability to peer inside thunderstorms and determine if there is rotation in the cloud, often a precursor to the development of tornadoes. There are 155 WSR-88D Doppler radars in the nation, including the U.S. Territory of Guam and the Commonwealth of Puerto Rico, operated by the National Weather Service and the Department of Defense. 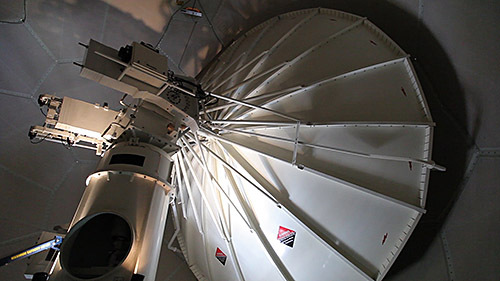 The Weather Surveillance Radar (WSR) - 88d, inside the white dome.